There are plenty of orchestral libraries on the market already, but this is yet another that demands attention. …If you already know what you're doing. Yet another symphonic orchestral library for Kontakt claiming to "keep things simple and straightforward". The 7.9GB (compressed) soundbank is divided up into Strings, Brass, Woodwind and Percussion sections, each containing three or four instrument types. "As long as you know what you're doing compositionally, Da Capo is indeed a breeze to use"
Each instrument type incorporates up to five articulations, which can be stacked in the All Sections patch (Pizz+Sustain, for example), and keyswitched in the Ensemble and Lite patches, while four separate mic channels and a convolution reverb enable basic mixing, with Kontakt's other effects on-hand for further sound design if required. The sounds throughout are absolutely gorgeous, particularly the strings and percussion, which are as warm and expansive as they come . 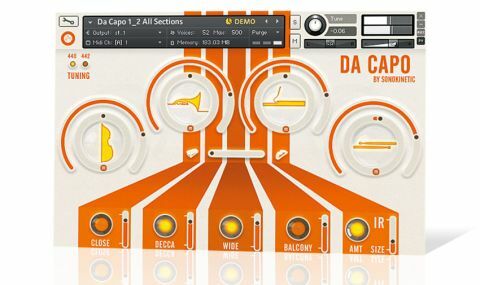 And as long as you know what you're doing compositionally, Da Capo is indeed a breeze to use, with the four clearly defined levels of control (orchestra, section, instrument group, articulation) making workflow quick and easy.